The Aerospace has been a part of Breitlings Professional line since the launch of this wrist computer back in 1985! The Aerospace is part of a series of watches manufactured with planes, it’s Pilots and pure Aviation in mind. The Aerospace is truly a legendary model, this electronic multifunction chronograph in satin-brushed titanium displays a powerful, dynamic and technical style. It is distinguished by its particularly simple and logical control system. Simply rotating, pressing or pulling out the crown is enough to operate the entire set of functions that are useful to pilots. This particular Aerospace also features a minute repeater. The minute repeater is a device that provides a sonic indication of the hours and minutes simply by pressing on the crown when the latter is in the neutral, local-time, seconds-date or day-date position. Four different sonic sound codes correspond respectively to: hours, quarter hours, 5 minutes and minutes. 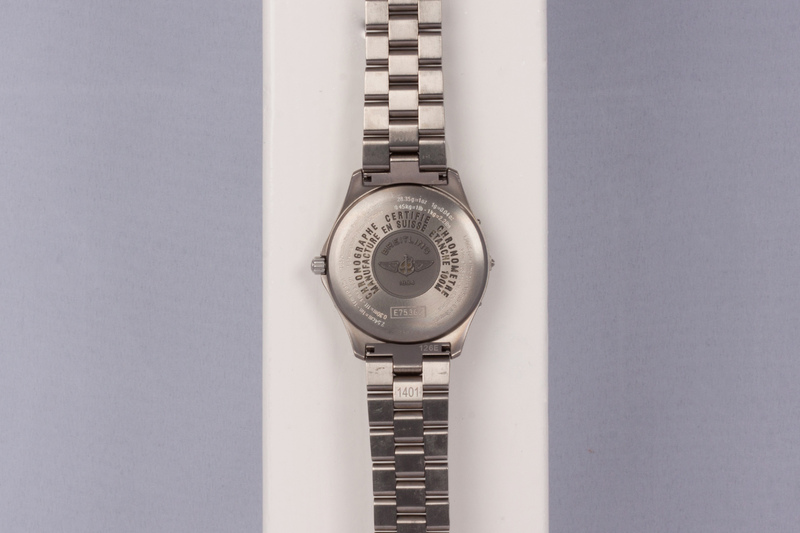 As briefly mentioned earlier, the entire watch is made out of brushed titanium, the bracelet included. 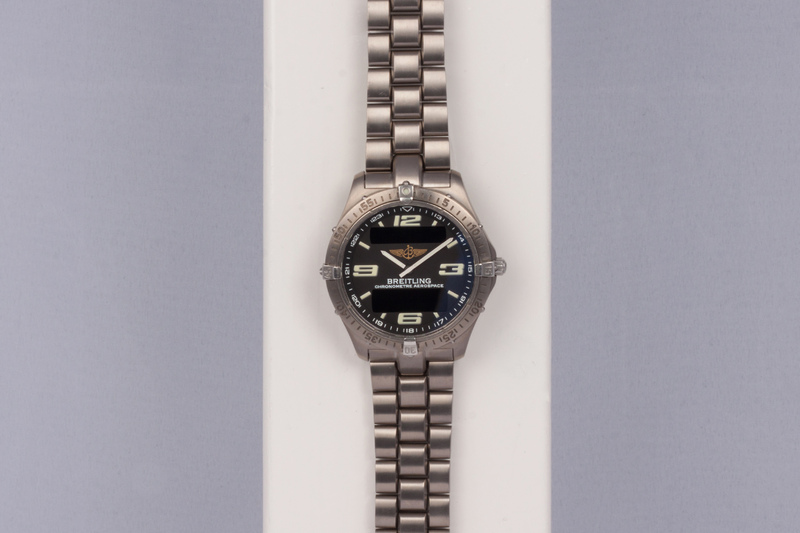 This gives the entire watch an almost military look and feel, something we really like! The dial, with it’s grey color matches the look of the brushed titanium. The hour-markers and hands are filled with Super-Luminova and provide you with an excellent readability in low light and dark (cockpit) conditions. The digital functions feature an alarm, chronograph, second timezone, day and date indication, countdown-timer and a choice between 12 or 24 hour display. 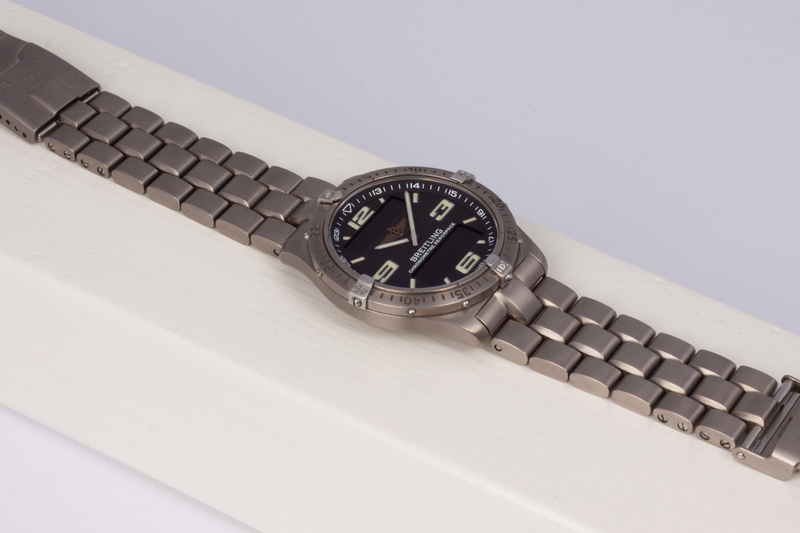 When on the wrist you’ll hardly know the watch is there, this is all thanks to the Aviation grade titanium the watch is made of, it wears very comfortable! 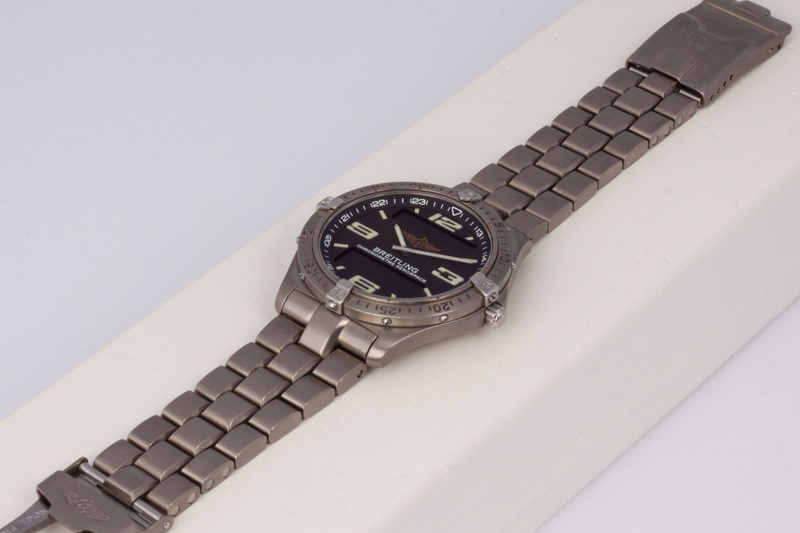 This Aerospace is in a very good condition and is accompanied by a Breitling Service pouch and all it’s original paperwork; the manual, warranty booklets, Breitling Service Center paperwork, titanium spare links, Breitling hangtag, bezel-protector, COSC certificate etc. The previous owner (a commercial Airline pilot) really took good care of his beloved Toolwatch! The Breitling Super Quarzt movement has been fully checked by our watchmaker and is fitted with a new and correct battery. box and papers? yes, full set.